Special counsel Robert Mueller has sent his long-awaited report to Attorney General William Barr, according to a letter from Barr to several Senators. “Special Counsel Robert S. Mueller III has concluded his investigation of the Russian interference in the 2016 election and related matters,” the letter said. Mueller is “not recommending any further indictments,” a senior DOJ official told Fox News. President Donald Trump has not received the report yet, White House Press Secretary Sarah Sanders said in a March 22 statement. The report is confidential, Barr’s letter reads, and marks the end of Mueller’s Russia probe. The Special Counsel’s Office didn’t immediately respond to a request for comment. Mueller was appointed in May 2017 to investigate Russian interference in the 2016 election and allegations of collusion between the Trump campaign in such interference, as well as any matters that arose from the probe. The scope of the probe was provided by Deputy Attorney General Rod Rosenstein and was revised in August 2017, most of which remains heavily redacted (pdf). As a result, the full purpose of this memo remains unknown to the public. The special counsel has secured indictments against some two dozen Russians, who are unlikely to ever appear in court, for alleged election meddling and cyber intrusions. He also indicted several Trump campaign associates for process crimes or violations unrelated to the Russian interference. None of the indictments substantiated the collusion allegations. President Donald Trump recently said he wouldn’t mind having the upcoming Mueller report publicly released. At least 11 of them made campaign contributions to Democratic candidates, mostly Barack Obama and Hillary Clinton. None are currently registered as Republican. At least two people were removed from or left the Mueller team due to bias against Trump in their internal communications. One was former FBI Deputy Assistant Director Peter Strzok and the other was identified by Rep. Mark Meadows (R-N.C.) as Kevin Clinesmith, an FBI attorney. Lisa Page, former special counsel to then-FBI Deputy Director Andrew McCabe, left the Mueller probe before texts with Strzok emerged, revealing strong animus against Trump. She was also Strzok’s mistress. 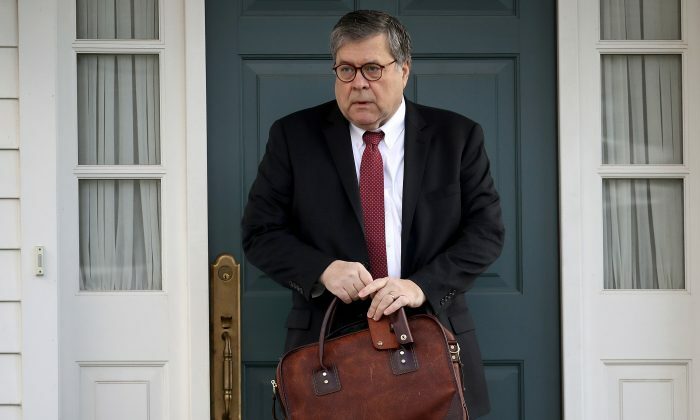 Trump’s new attorney general, William Barr, committed during his Jan. 15 confirmation hearing to releasing as much of the Mueller report as laws and regulations allow. Barr said he was shocked to see the text messages between Strzok and Page. Upon a request from Justice Committee Chair Sen. Lindsey Graham (R-S.C.), he committed to find out if the FBI’s Russia investigation, which Mueller eventually took over, was conducted appropriately. In 2016, the FBI obtained a FISA warrant to spy on Trump 2016 presidential campaign associate Carter Page, and in the warrant, the FBI used the Steele Dossier, a collection of unsubstantiated claims about Trump-Russia ties compiled by former British spy Christopher Steele, who was commissioned by the Democratic National Committee and the 2016 presidential campaign of former State Secretary Hillary Clinton. Evidence has since emerged that officials were aware the dossier is unverified and its source politically biased.